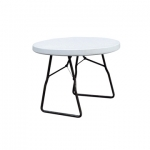 We stock a great range of metal garden furniture including metal table and chair sets, metal garden tables and cast aluminium benches. 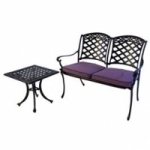 Our metal garden furniture will suit every budget and is stocked in our warehouse ready for next day delivery. No patio area is complete without our Kingfisher Mosaic Bistro Patio Set! It recently appeared on Channel 4s 'The Home Show' and its real mosaic finish makes it incredible value for money. If you need further proof take a look at the countless positive reviews we have received over the last few years. As our best seller it speaks for itself, the fold away chairs and beautiful real mosaic table are even suitable for smaller areas such as balconies and small patio areas. For cheap Mosaic Patio Sets you won't find better value for money or quicker next day delivery! We have taken our time to select the best manufacturers of metal garden furniture and are proud to stock AFK Garden Furniture, Athol Garden Furniture, Norfolk Leisure Garden Furniture, Lifestyle Garden Furniture, La Hacienda Garden Furniture and Kingfisher Garden Furniture. We are sure you will find the perfect metal garden furniture to suit your garden, patio or decking.